So too, the AMA takes Indigenous health very seriously. Last year, I travelled to Darwin to launch our annual Indigenous Health Report card, which focused on Rheumatic Heart Disease. In simple terms, RHD is a bacterial infection from the throat or the skin that damages heart valves and ultimately causes heart failure. It is a disease that has virtually been expunged from the non-Indigenous community. It is a disease of poverty. RHD is perhaps the classic example of a Social Determinant of Health. It proves why investment in clean water, adequate housing, and sanitation is just as important as echocardiography and open heart surgery. Smart policy. Saving money. Preventing heartache. The right thing to do. 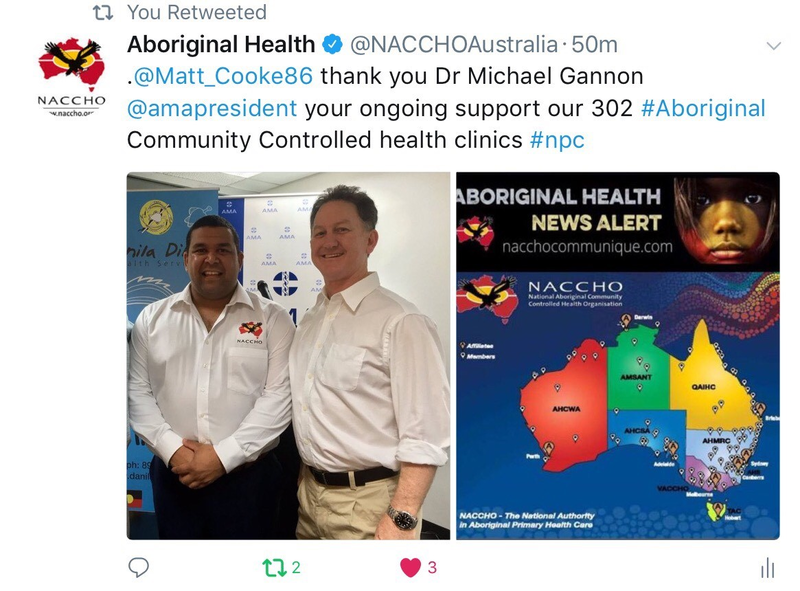 I remain committed to partnering with other health professionals and champions of Indigenous health like Ken Wyatt and Warren Snowdon to continue to Close the Gap. Good afternoon. 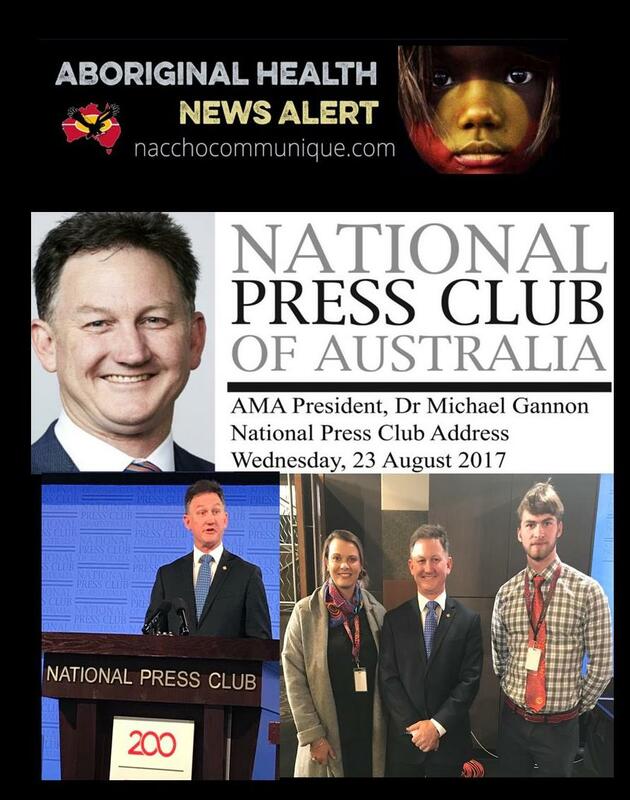 It is a great honour to address the National Press Club for a second time as AMA President. There have been many changes over the last twelve months. There is no more talk of co-payments. The cuts to pathology and diagnostic imaging bulk billing incentives have been reversed. The general practice pathology rents issue has, for the most part, been resolved. The Medicare freeze has a ‘use by date’. It can’t come soon enough. The AMA wanted an immediate end to the freeze right across the Medicare Benefits Schedule. We did not get it. But in 300 days’ time we will see a return to annual indexation of patient rebates to see GPs and other specialists. The extended freeze has been a major contributor to out-of-pocket expenses when patients see doctors. We have a new Health Minister – Greg Hunt. He has been consultative and highly engaged with the health sector. He and I speak most weeks. He is a good listener. He genuinely wants to be across the complexities of his portfolio. The same can be said of Shadow Minister Catherine King and Greens Leader Richard Di Natale. They get health. They know how health policy affects people’s lives. This is why Greg Hunt has played a key role in repairing the Government’s relationship with the major stakeholders in health – with the backing of the Prime Minister. The health policy environment is much calmer, but this does not mean that everything has been fixed. Far from it. There is plenty of heavy lifting to do. These include long-standing structural issues around public hospital funding, private health insurance, the Review of the Medicare Benefits Schedule, and the My Health Record. 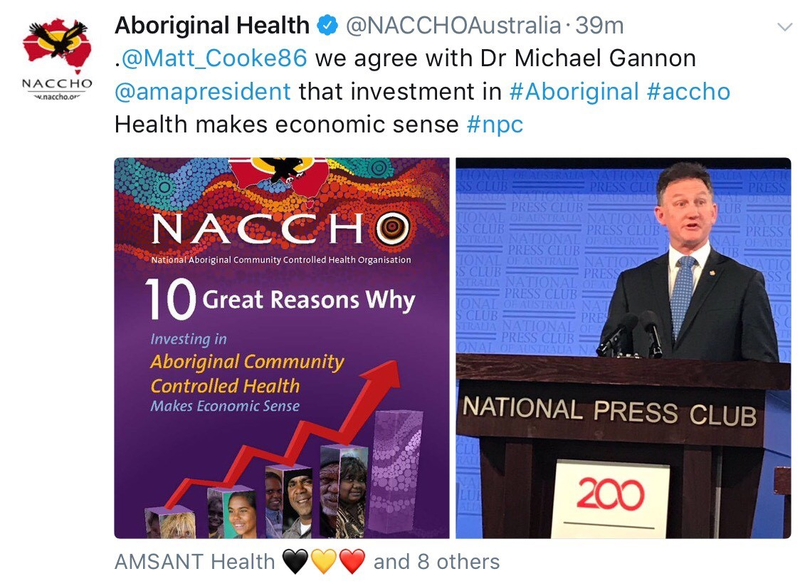 The AMA’s priorities extend to Indigenous Health, medical training and workforce, the Pharmaceutical Benefits Scheme, and the many public health issues facing the Australian community – most notably tobacco, immunisation, obesity, and alcohol abuse. I have called for the establishment of a no-fault compensation scheme for the very small number of individuals injured by vaccines. I have called on the other States and Territories to mirror the Western Australian law, which exempts treating doctors from mandatory reporting and stops them getting help. We also need to deal with ongoing problems in aged care, palliative care, mental health, euthanasia, and the scope of practice of other health professions. In the past 12 months, the AMA has released statements on infant nutrition, female genital mutilation, and addiction. In coming months, we will have more to say on cost of living, homelessness, elder abuse, and road safety, to name but a few. Then there are the prominent highly political and social issues that have a health dimension, and require an AMA position and AMA comment. All these things have health impacts. As the peak health and medical advocacy group in the country, the community expects us to have a view and to make public comment. And we do. Not everybody agrees with us. But our positions are based on evidence, in medical science, and our unique knowledge and experience of medicine and human health. Health policy is ever-evolving. Health reform never sleeps. I cannot and will not cover all these issues in my prepared speech today. There is not time. I will highlight a few of the most pressing. As I have stated many times, health is the best investment that governments can make. Health should never be considered just an expensive line item in a budget – it is an investment in the welfare, wellbeing, and productivity of the Australian people. Despite constant claims to the contrary, often from governments, Australia’s health budget is not experiencing an expenditure crisis. In the 2016-17 Budget, health was 15.8 per cent of the total, down from 18 per cent in 2006-07. While health spending has reached a 10 per cent share of GDP, this is less than comparable countries. France, Sweden, Germany, and Switzerland all spend 11 per cent. The United States, with their managed care system of private medicine demands more than 17 per cent of GDP to provide worse health outcomes. Our system may be the envy of many other countries, but that doesn’t mean we can’t or shouldn’t seek to improve it. Our health system cannot improve without properly-resourced public hospitals. The doctors, nurses, and other staff who work in them are some of the most skilled in the world. In 2015-16, there were more than 6 million episodes of admitted patient care in Australia’s public hospitals. Between 2011-12 and 2015-16, the number of separations rose by 3.3 per cent on average each year. This was greater than the average growth in population over this period, which was 1.6 per cent. In 2015-16, public hospitals managed 92 per cent of emergency admissions. They provide services in a time of need. But they need support. We are not meeting critical targets. Against key measures, the performance of our hospitals is stagnant or declining. Bed number ratios have remained static despite the celebrated opening of multiple shiny new hospitals. Emergency Department waiting times have worsened and, in most cases, they remain well below the target set by governments to be achieved by 2012-13. The percentage of ED patients treated in four hours has not moved over the past three years. It is well below our target of 90 per cent. Elective surgery waiting times have worsened. Only last month, it was suggested that there wasn’t enough ‘competition’ between public hospitals. Competition? I can’t imagine the mother of a young child with suspected meningitis checking the internet at midnight to see which hospital might provide the most competitive offer. No, that family would be rushing that child to the nearest ED. We hear more and more about the idea of ‘docking’ funding to hospitals for what are deemed ‘avoidable readmissions’ and ‘acquired complications’. Doctors take an oath to look after patients. They take it seriously. They train their entire careers with the primary purpose to heal people. To make them better. The idea that a financial disincentive, applied against the hospital, will somehow ‘encourage’ doctors to take better care of patients than they already do is ludicrous. Unfortunately, some complications are unavoidable. Where there are errors, or where targets are not met, these are almost always due to not having the resources, the staff, or the time. Taking funding away from hospitals would make things worse. We need greater certainty and an increase in funding. We call on the Federal Government and the States and Territories to listen to doctors in the lead-up to 2018 negotiations. The concept of a 10-year funding agreement sounds attractive. But it must not become a plan to simply lock in chronic underfunding. Our public hospitals would not survive without the support of our private health system. As a private practitioner who works in the public system, I am well placed to comment on the relationship between these two pillars of our health system. Australia’s health system relies on the dual system of public and private health. The two complement each other. Nearly 70 per cent of elective surgery occurs in private hospitals. We often talk about private health offering choice – choice of doctor, choice of hospital. It’s why people take out insurance policies. But we also need to talk about private health as a critical component of taking pressure off the public system. As a forceful advocate for public hospitals and those Australians who do not have the luxury of a choice, I am therefore an advocate for private health. However, I am concerned. Very concerned. If we do not get reforms to private health insurance right – and soon – we may see essential parts of health care disappear from the private sector. Doctors have a complicated relationship with private health insurance. Indeed, private health insurance itself is complicated. There are more than 20,000 policy variations around the country. They are littered with inconsistent terminology and a bewildering array of exclusions, caveats, carve-outs, and excesses. There are policies out there that offer inappropriate cover. There are cases where removal of metal is not covered. So, you have had your head caved in. A surgeon repairs the fracture and inserts a plate at midnight on a Saturday night. All covered by health insurance. But they do not cover removal of that plate at a later date. We have seen cases where mothers covered for pregnancy have been told their newborn baby cannot be looked after in the special care nursery. We are calling for pregnancy cover to be included in all levels of policies, adding it to the risk equalisation pool. It’s a natural part of life. Two thirds of pregnancies are unplanned. So let’s cover it properly, spread the cost appropriately, and make it affordable for more people. The same applies to mental health services. Suffering anxiety, depression, or a situational crisis are all too common ‘speed bumps’ in life. They are not predictable. This is why we need insurance. We need to put the concept of value back into private health insurance. Market power has dramatically shifted in favour of the private health insurers. They are deciding who can provide what treatment, and where they can provide it. We have situations where clinical decision-making is being questioned, and overridden, in some cases, by insurers. Insurers are also insisting practitioners agree to the publication of their details, their fees, and allowing customer testimonials that they do not get to verify. The consideration of clinical performance and the years of training to improve safety and quality cannot be captured in a customer ‘star rating system’. Joint replacement surgery is a bit more nuanced and complicated than an Uber ride. We note also that contracting arrangements with hospitals have ‘no pay’ clauses for adverse events. Insurers should not interfere with the established safety and quality system that is achieved via the independent accreditation agencies. The AMA will fight this deliberate drift towards United States style managed care – a system that performs worse than ours according to nearly every metric. In the last decade we have seen the PHI industry move from one that was dominated by Mutual insurers, who have members, to for-profits, who have policy-holders and, of course, shareholders. Private health insurance should serve the needs of health consumers who have paid for it. Patients should not have health care options available to them curtailed for profits. We see premiums rise five to six per cent every year, at the same time that people are facing increasing cost of living pressures. It is no surprise that we see people downgrading or dropping their cover. This has to stop. It requires careful Government action. Doctors are not the affordability problem. Too often we hear misguided and misinformed claims – usually from the very big, very powerful health funds – that doctors’ fees are the reason that premiums are rising. This is an appalling and deliberate lie. As soon as a doctor charges one cent above the insurers’ scheduled fee or, where it exists, their known gap arrangement, the insurer reverts to paying only 25 per cent of the MBS scheduled fee. That’s about $330 for a hip replacement, $170 for delivering a baby. The insurers actually save money! In an admission to hospital that might cost $30,000, do you really think the doctor’s fee is the affordability problem in PHI? But the statistics again disprove it. Doctors’ fees are only 16 per cent of insurer outlays. Australian Prudential Regulation Authority (APRA) statistics show that 88.1 per cent of services are charged at no gap. That is, nothing to pay – zero dollars. The patient’s health insurance covers it. A further 6.9 per cent are at a known gap of $500 or less. Now reflect on the fact that the MBS hasn’t been indexed since 2013. Nor have the insurers indexed their payment schedules anywhere near health inflation, if at all. APRA recently reported that insurers’ profits were up 17 per cent to $1.8 billion before tax for the 2016-17 financial year. So governments and insurers set the underlying price for a service – and that price has largely been stagnant. As a private practitioner, I can promise you that my insurance, my rent, my electricity, my staff wages, my supplies, are all increasing in cost. Doctors have absorbed these costs. Just look at the combined no-gap and known-gap rate of 95 per cent. Let’s have a look at the out-of-pockets. The average known-gap cost for Anaesthesia is $96. So, a specialist doctor with 10 years of training and potentially 30 years of experience comes in to help out with an emergency Caesarean Section at 3.00am in the morning. Try getting your plumbing fixed for that price. Look at the bulk billing rates in general practice. They too have held firm. The medical profession has done its utmost best to protect patient access to affordable care. But unless the ‘payers’ in the system start to work with us, it is simply not sustainable. When we get instability, patients suffer. They lose access. They lose supply. They lose the quality of care they have a right to. We will continue to participate in the Ministerial Advisory Committee. But our patients need and deserve certainty. And so do doctors. An area of great concern to the medical profession has recently re-emerged. The reforms and protections put in place by then Health Minister Tony Abbott are showing signs of stress. While back in the UK recently, I saw what could happen here again without intelligent policy. Medical indemnity in the UK is becoming unstable. The two major providers have pulled out of private Obstetrics. There is talk of pulling out of coverage in other high risk areas. More than a decade ago, the AMA advocated tirelessly, brought together the profession, and worked with the Government to design a series of schemes that have been a resounding policy success. They promote stability. They provide affordable insurance, which flows through to affordable care. That has been the AMA’s strong message heading into the current review of indemnity insurance. Thankfully, the Government has been receptive to our advice, and I am grateful to Minister Hunt for listening. He was surprised to hear that annual premiums got as high as $126,000 a few years ago. And that’s after the support schemes’ contributions are taken into account. We now have a review that is focussed on improving and building on the current policy success. It is not a savings exercise. It removes a threat to a stable medical workforce. For many Australians, access to a doctor remains a problem. People in rural Australia often find it difficult to access care in a timely fashion. But the problem is not that we don’t have enough doctors. We have more doctors per head of population than the OECD average. We are graduating record numbers of medical students, putting us well above the OECD average. But we are not providing enough prevocational and specialist training places for our medical graduates. We must address workforce shortages in particular specialty areas. Many people think that medical training finishes at the medical school gates. However, medical training is a much longer journey. It requires an internship, a period of prevocational training and, ultimately, specialist training, which can last upwards of seven years. With record medical graduate numbers, the pressure this is placing on the medical training pipeline is widely acknowledged. Next year we face a shortage of 569 first year advanced specialist training places. The bottleneck of doctors in training waiting to get on to a specialist training program is growing, and the projections suggest it will only get worse. This has implications for the community’s access to services, and the career aspirations of our best and brightest. We do not need more medical school places. The focus needs to be further downstream. Unfortunately, we are seeing Universities continuing to ignore community need and lobbying for new medical schools or extra places. This is a totally arrogant and irresponsible approach, fuelled by a desire for the prestige of a medical school and their bottom line. Macquarie University is just the latest case in point. With a looming oversupply of doctors, they have developed a $250,000 medical degree for those who are wealthy enough to be able to afford it. With that kind of debt, their graduates will not work in areas where they are needed. They will opt for more lucrative specialties in major metropolitan locations – assuming they can get a job at all. It’s an example of greed trumping need, and governments need to work with the AMA to stop this from happening. The evidence clearly shows that, if you select doctors from a rural background, or provide them with opportunities to train in rural areas, they are much more likely to work in a rural area. We support Minister Gillespie and his idea for training hubs in the regions. We will keep arguing about the problems with Bonding. We hope that more graduates will choose general practice or rural practice, or both. We will continue to argue for measures that will work. General practice is under pressure, yet it continues to deliver great outcomes for patients. The decision to progressively lift the Medicare freeze on GP services is a step in the right direction. But the Government needs to do much more to recognise and reward quality general practice. The Government is proceeding with its Health Care Homes trial and, while we share the vision of the trial, it is not without problems. Significant questions also remain over the adequacy of funding for the trial, given the Government is asking GPs to do more for patients, but with no additional investment. It will be a number of years before we learn what impact the trial has had for patients, health costs, and whether it relieves pressure on our hospital system. General practice can’t wait that long. It is already under pressure and needs new investment now. We must have everything funded and connected – strong primary care, led by general practice; properly resourced public hospitals; and a complementary private hospital sector underpinned by a stable private health insurance industry. This is a handy ‘to do’ list for the Government. I turn now to a couple of topics that have put the AMA is a different sort of spotlight. The AMA gets accused of being too conservative. So, it was not totally surprising to see the reaction to the launch of our new Position Statement on Marriage Equality a few months back. The AMA position generated significant coverage in both mainstream and social media. It also generated interest within our membership, the medical profession more broadly, and with the general public. We received overwhelming support – in line with public opinion polls which indicate the majority of Australians support marriage equality. Our Position Statement outlines the health implications of excluding LGBTIQ individuals from the institution of marriage. Things like bullying, harassment, victimisation, depression, fear, exclusion, and discrimination, all impact on physical and mental health. I received correspondence from AMA members and the general public. The overwhelming majority applauded the AMA position. The AMA will from time to time weigh in on social issues. We should call out discrimination and inequity in all forms, especially when their consequences affect people’s health and wellbeing. It is not our place to determine how we achieve marriage equality. That is for our legislators. We hope this process goes ahead with honesty and respect. Last year, we released an updated Position Statement on Euthanasia and Physician Assisted Suicide. It came at a time when a number of States, most notably South Australia and Victoria, were considering voluntary euthanasia legislation. There was an expectation in some quarters that the AMA would come out with a radical new direction. We didn’t. The AMA maintains its position that doctors should not be involved in interventions that have as their primary intention the ending of a person’s life. This does not include the discontinuation of treatments that are of no medical benefit to a dying patient. This is not euthanasia. Doctors have an ethical duty to care for dying patients so that they can die in comfort and with dignity. We are always there to provide compassionate care for each of our dying patients so they can end the last chapter of their lives without suffering. We believe that governments must do all they can to improve end of life care for all Australians. They must properly resource palliative care services and advance care planning, and produce clear legislation to protect doctors who are providing good end of life care in accordance with the law. Of course, euthanasia is a matter for society and its Parliaments. However, if new legislation does come into effect, doctors must be involved in the development of the legislation, regulations, and guidelines. We must protect doctors acting within the law, vulnerable patients, those who do not want to participate, and the wider health system. There is already a lot that doctors can ethically and legally do to care for dying patients experiencing pain or other causes of suffering. This includes giving treatment with the intention of stopping pain and suffering, but which may have the secondary effect of hastening death. I reiterated all of this yesterday in an address to 40 MPs in Victoria, imploring them to legislate protections according to this ‘doctrine of double effect’. Bills in South Australia and Tasmania have been defeated. I encourage politicians in Victoria to ‘put the horse before the cart’ and focus on the everyday issues in end of life care. Our position does not appeal to everyone, least of all high profile euthanasia campaigners and their enthusiastic supporters in the media. We also have members who differ in their view. But our position, supported by the overwhelming majority of our Federal Council, is supported by the bulk of the medical profession. There are medical, ethical, and moral responsibilities at the heart of the doctor-patient relationship, and we all take them and our oath, the Declaration of Geneva, very seriously indeed. The significance of challenging social issues like Indigenous health, marriage equality, and euthanasia is that they highlight the unique position and strengths of the AMA. We rely near totally on member subscription income to survive. I can promise you, as a Board member, it is often a concern. But unlike many other lobby groups, inside and outside the health industry, this gives us a total legitimacy to speak honestly, robustly, and without fear or favour in line with our mission – to lead Australia’s doctors, to promote the health of all Australians. We have strong public support and respect as the peak medical organisation. The AMA was recently ranked the most ethical organisation in the country in the Ethics Index produced by the Governance Institute of Australia. People want and expect us to have a view, an opinion. Sometimes a second opinion. The media demand that we have an opinion. And not just on bread and butter health issues. But also on social issues that have an impact on health. Our view is never knee-jerk. We consult our members and the broader medical profession. Often we encourage feedback from other health professionals – the ones who provide quality health care with us in teams. We attract public feedback whether we like it or not. I can promise you that social media has taken this to a whole new level. In the last year I have been criticised by the Pharmacy Guild, the College of Midwives, the Greens, One Nation, the ALP, the Coalition, pro-Euthanasia campaigners, E-cigarette enthusiasts, Anti-Vaccination campaigners, shareholders in Medicinal Cannabis enterprises, and the occasional celebrity chef. And that is before I get home to my 13 year old daughter. All of our consultation and engagement informs our policies, our views, our opinions. Our opinions are not designed to be popular. Many feel uncomfortable when we talk about healthcare standards for asylum seekers and refugees on Nauru and Manus Island. We make Australians feel uncomfortable when we ask them to reflect on the amount they drink and the fact that licit drugs like tobacco and alcohol cause far more carnage than Ice ever will. People might not like it when we use scientific evidence to inform our views on the limitations on the usefulness of Medicinal Cannabis, climate change and health, air quality, expanding adult and child vaccination programs, restricting Codeine use, or call for a tax on sugar-sweetened beverages. We are the only body that can possibly represent the whole medical profession – from medical student to retired doctor, from Psychiatrist to Vascular Surgeon to Paediatrician, whether trained in Mumbai or at Monash. From Busselton to Bundaberg, we will continue to fight for the health of our patients and their communities. That is why governments take notice of our policies. They are informed by what our patients and what our members tell us, based on what is happening at the front line of health service delivery. I want to finish today with a message to our political leaders. Last year we had a very close election, and health policy was a major factor in the closeness of the result. The Coalition very nearly ended up in Opposition because of its poor health policies. Labor ran a very effective Mediscare campaign. As I have noted, the Government appears to have learnt its lesson on health, and is now more engaged and consultative – with the AMA and other health groups. The next election is due in two years. There could possibly be one earlier. A lot earlier. As we head to the next election, I ask that we try to take some of the ideology and hard-nosed politicking out of health. I talked today about some of the structural pillars of our health system – public hospitals, private health, the balance between the two systems, primary care, the need to invest in health prevention. Let’s make these bipartisan. Let’s take the point scoring out of them. Both sides should publicly commit to supporting and funding these foundations. The public – our patients – expect no less.